It dates back to the Kamakura era (1192-1333). In 1324, Kitano Tenmangu was built in the present Hashima City in Gifu prefecture by order of Emperor Godaigo　(reign 1318-39). 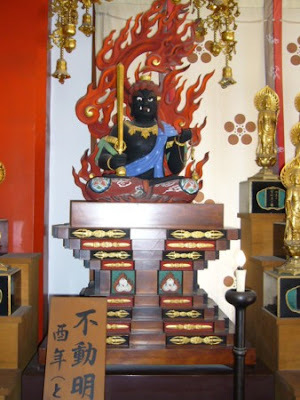 They dedicated this shrine to Sugawara Michizane (Tenjin-sama 845-903) as a god of education. There were always many plum trees planted with in the precincts.As he was fond of plum blossomes since his childhood.In those days , it was regarded as the most noble and beautiful flower among the others. The crest of the 'plum blossom' is the symbol of the Tenjin-sama. It has been used as the crest of our temple for this reason. 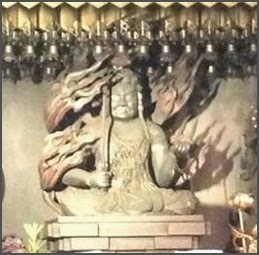 The principal image of Osu kannon is the statue of Kanzeon Bosatsu. It was carved by Kobo-Daishi. It is a secret statue and will be shown next in 2030. Osu Kannnon Temple was situated at the large shallow area surrounded by the Kiso and Nagara river and served for a strategic position. In Edo era(1603-1868), in order to protect the Togugawa family in Owari,the river bank was constructed intentionally higher than the one of Mino distinct in which original Osu Kannnon Temple by three-jaku(approximately 90.9cm). So it was flooded many times. At last the flood in 1605 washed away the temple except some treasures of it including some valueable books.For the security of this residuum,the temple was moved to the present place by Tokugawa Ieyasu in 1612. At that time the place was changed from Hiokimura-village to Osu. In Bunsei era(1820's), 100 years after the temple was moved to the present site,unfortunately the pagoda was burned down in the big-fire in Meiji era (1868-1912) together with the main temple,the shoin,(the living quarters of the temple), Kannon hall and the gate with Two Deva Kings.The present main temple was reconstructed in 1970.It took three years and costed 750 million yen(about 580 thousand dollars).
. kamihari Jizoo 紙貼り地蔵 Jizo to paste paper on . 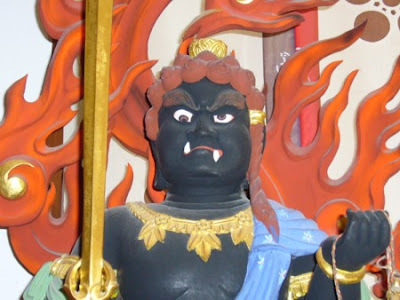 鬼は外 - は禁句 - Oni wa soto - Demons Out! is not allowed to chant.